"Mountaintop coal mining raises birth defect risks" -- how shocking. Tea baggers and the Taliban have many things in common. Soon in the not-so-distant future we will have lifeless oceans. Based not on fear-mongering but rather facts (unfortunately). Man robs a bank so that he can obtain health care in prison. Why doesn't he just go to an emergency room each time he needs health care, as GW advised....? Several good suggestions from Bill Clinton re job creation. Take a good look at this chart. Notice the three big dips prior to the current one? See what they have in common...? Wars. 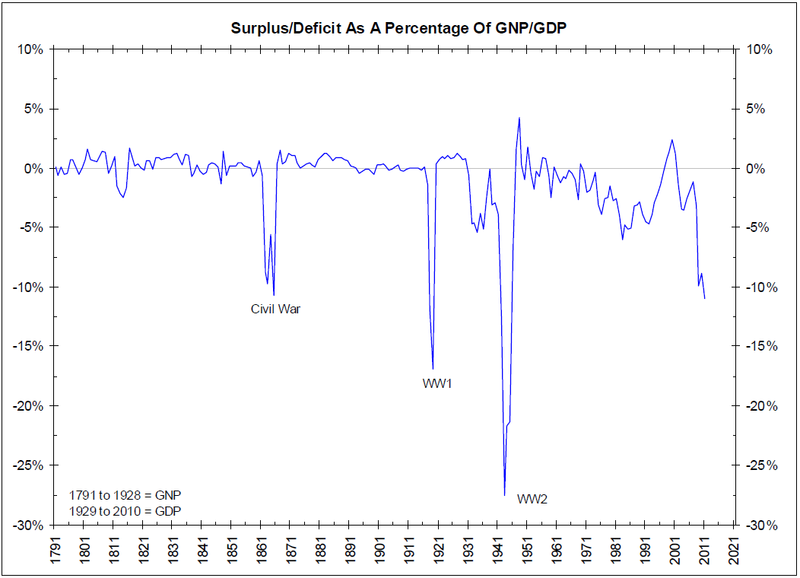 I wonder if the Iraq & Afghanistan wars have added much to our deficit (click here). The headline in Sunday's Boston Globe, "‘RomneyCare’ — a revolution that basically worked." I think it speaks volumes about today's GOP when they have a presidential candidate who by all accounts has one clear success to his credit as governor, and yet he is forced to run away from it as if it was a failure. Complete and utter Orwellian insanity. When congressional Republicans cut the Environmental Protection Agency’s budget 16 percent as part of a deal with President Obama in April to keep the government running, they hailed it as a blow to a federal bureaucracy that had overreached in its size and ambition. But now that the agency has detailed how it is making the $1.6 billion cut for fiscal 2011, the reality is somewhat different. Because the EPA passes the vast majority of its money through to the states, it has meant that these governments — not Washington — are taking the biggest hits. Already constrained financially at home, state officials have millions of dollars less to enforce the nation’s air- and water-quality laws, fund critical capital improvements and help communities comply with new, more stringent pollution controls imposed by the federal government. The EPA was a central target for Republicans during the spring budget battle, as they tried to curtail its authority to curb greenhouse gases, mercury and other pollutants. Although lawmakers failed to secure those provisions, they limited the agency’s activities through budget cuts. Can someone tell me how Tea Partiers and the like do not see how such moves by Republicans in office are detrimental to their well-being? Our deficit amounts to trillions of dollars and yet Republicans cravenly decide what needs to be done to save some money is cut a measly $1.6 billion from the EPA's already miniscule budget (about $10 billion total). It's obvious the move is a gift to corporate polluters, however Republicans dress it up as curtailing run-away government regulation and the idiotic Tea Party folks just lap it up, gladly accepting the insult to their intelligence. No protest or angry criticism from them, not a peep. Why pound foolish? Many studies show the added health care costs stemming from soot, toxins & other pollutants released into our air and water amount to well over $50 billion per year, not to mention the thousands of premature resulting deaths. In effect, the EPA's meager budget is an absolute bargain both in costs and lives saved. But again, Republican constituents are seemingly too stupid to realize this simple fact, choosing instead to allow their emotions to rule over rational thinking -- and no one is better at playing on fear and anger than the GOP. Until people wise up to what's truly behind Republican motives, this country will continue to suffer. But I thought Tim Pawlenty was going to be this voice of courage, willing to make hard choices and candidly speak his mind? With his now infamous ObamneyCare-dodge, guess not. Just another spineless wimp. One hardly knows where to start with it. Probably with the assumption that we can reach 5 percent growth for 10 straight years—when from 1947 to 2010, the average has been 3.3 percent. This is a contemptible piece of nonsense, but at least it’s not really harmful. What would be harmful are Pawlenty’s tax proposals, which soak the poor and reduce the burden on the rich more nakedly than any Republican plan I have ever seen. He would eliminate—completely!—the capital gains tax and the estate tax. Of course he’d massively lower income-tax rates. Oh, and he’d get rid of loopholes. (Yeah, sure.) Of course the little schlubs would keep paying those payroll taxes, but I suppose he hopes they can be distracted with some Jesus talk. [T]he bilious idiocy of Pawlenty’s numbers shows just how far removed from economic reality this country is getting to be. The Republicans have lost any connection to earth, and the Democrats are afraid (with a few noble exceptions) to tell the American public the truth. In such a context, erstwhile conservative Republican Ben Bernanke emerges as a courageous truth-teller for saying something as simply and obviously true as that enacting sharp spending cuts now will hurt the economy. Time was when Republicans listened to the Fed chairman. But these days I guess he’s a socialist, too. Your article on ex-governor Tim Pawlenty left me flabbergasted and angry ["Mr. Nice Guy," May 30]. As a Minnesota resident, I can assure you his appeal is not in "the middle" here. The poor, the old, veterans and schoolchildren all suffered under his stewardship, and the "fees" imposed to generate revenue (Pawlenty didn't call them taxes) didn't help. Pawlenty is an aw-shucks, smooth-talking panderer whose regular-guy image masks craven opportunism. When Pawlenty took office, Minnesota was prosperous and comfortable. It is now broke and angry. It's not true that he "cut taxes and reined in spending." He just created a massive tax shift from income taxes to property taxes, while spending down every savings account and rainy-day fund the state had. Pawlenty couldn't get elected dogcatcher here. Please don't wish him on our country. According to Republicans, our deficit is #1 priority and yet Pawlenty was pretty abysmal on this front while governor. Not surprising. Confirmed: $6 billion in hard-earned taxpayer money stolen in Iraq, under GW's watch. Imagine the GOP outrage if occurred under Obama. But then as we know with Weiner's resignation (versus Vitter, Ensign, Craig, Sanford, etc. ), it's OK as long as one is a Republican. By putting Rick Scott into the governor's mansion in FLA, it just confirms the wackiness of FLA voters. See here, here and here. And to think these voters may be key (again) in deciding our next President in 2012 -- ugh. remain on the side of the truth.” Too bad today his respectful sentiment no longer applies since one side is clearly not for truth. OMG! A banker sentenced to prison! It's a start. I recently read T.R. Reid's "The Healing of America" and I highly recommend it if you wish to learn more about how our health care system compares versus other developed nations. Reid obliterates much of the fiction and scare-tactics used by the "death panel" folks. Truly eye-opening revelations. It's astonishing when you realize what other nations have compared to our dysfunctional, nonsensical and wasteful way of doing things. France, Canada, England, Germany, Switzerland, Japan, and Taiwan all have better health care systems than our own, cheaper with better outcomes, and all of these nations are very market-oriented. Yet a big reason why they succeed where we fail is they realized a successful healthcare system cannot be market-driven. In fact, Switzerland was fairly recently on our course with regards to a failing system, however they made the necessary reforms away from a for-profit system and lo/behold things have dramatically turned around for the better. When will we learn? Erasing facts and replacing them with lies. Hello Orwell's 1984. These folks are beyond scary. We're talking cult, not fans. And they celebrate ignorance in the name of patriotism. The Founding Fathers deserve light years better than this. Running out of scapegoats, the Vatican is now blaming Woodstock for the sexual abuse committed by priests. Palin screws up again when it comes to basic U.S. history. Oh yeah, let's definitely get her in that White House to straighten things out and make us all proud.... Further proof that at least 20% of the voting public are complete, utter morons. The goons are paying their minions to attack Elizabeth Warren. This alone should tell you just how effective she would be in her job as head of the CFPB. The financial lobby wants a go-along stooge.